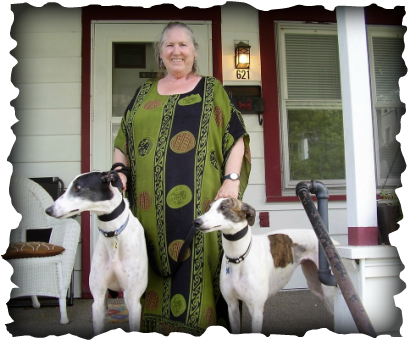 Kathy of Dayton adopted white and black Captain about a month ago and felt it was time to add another greyhound to the family. She decided she wanted a girl with a bit more energy to encourage the playful side of Captain. Be careful what you ask for! Suzy is an excellent match but her playfulness will take some getting used to - by both Kathy and Captain. Fortunately the dogs liked each other right away, and Suzy is very affectionate with Kathy. We are sure to see these three at future events and Meet and Greets.